On Wednesday, I’ll be on my way to Thailand for a culinary and Muay Thai (Thai Kickboxing) adventure. It’s been a while since I’ve been there and I am already starting to salivate at the thought of the delicious foods I will encounter on a daily basis. From the street food to the upscale restaurants, I am ready to eat! In fact, whenever I am anywhere in Asia, I am struck by how amazingly good the food centers are at malls. We have nothing on these people when it comes to food courts. Truly it’s embarrassing. A Panda Express – the greasiest chain Chinese you could imagine. Okay, I only have so much time on this planet and cannot spend another second summarizing the other mediocre food choices at a typical American mall. You know what they are. And if you don’t, then consider yourself lucky. An Asian food court or hawker centre as they are sometimes called, will have local dishes prepared quickly and priced reasonably. In Singapore, I recently paid 3.50 USD for a medium size plate of Hainan Chicken Rice and 4.30 USD for a huge platter of the freshest tropical fruit – a whole mango, pineapple, star fruit, dragon fruit, papaya, orange watermelon, plum, and a side of durian. In addition, the people at the food stalls will be proud of what they are making and happy to share part of their culture with you if you are visiting from overseas. It is fast and easy to get food from multiple stalls and have a varied and delicious eating experience in an Asian food court. 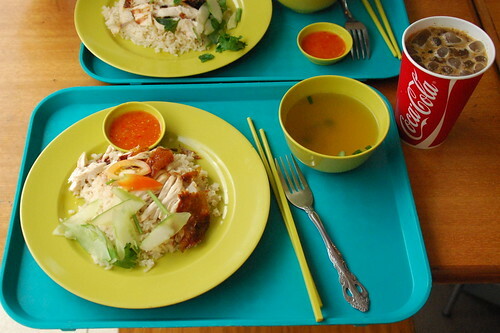 Once, you eat at an Asian food court you’ll never want to eat at an American one again. This entry was posted	on Monday, November 22nd, 2010 at 6:39 am	and is filed under Places. You can follow any responses to this entry through the RSS 2.0 feed. You can leave a response, or trackback from your own site. Enjoying the site – I love food pictures!! One suggestion – I don’t see a place on your home page to “follow” the site – in other words, get automatic updates sent to your email, etc. Maybe I’m just missing it, but this would be very helpful!!! Have a great trip!!! Glad you like the food pics. There should be more in the next few weeks as I am in Thailand and the food is amazing. I am on it regarding having a “follow” button and making sure you can get the updates to your email.